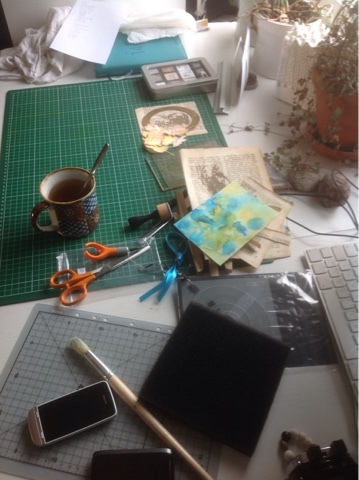 I have my tea cup, pieces laid out for a calendar page, some miss-stamps and my first try with alcohol inks. Short and sweet today, but I also have a doggy view. 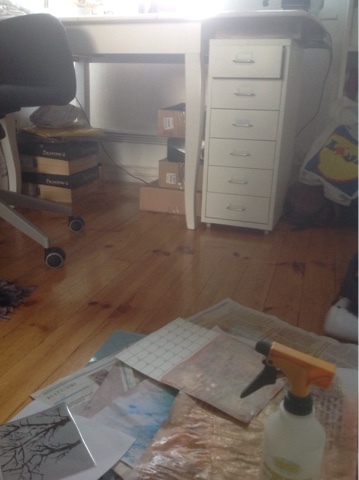 This is my messy spot on the floor, you can see the base for the calendar page drying and the stacks under the table. I'm in a hurry today, but I should be able to get around tomorrow. Maybe. Hi Kristiina, thanks for participating even though you are busy. I like you doggie view! I'd better not show mine! I spy a box of mini distress inks! I didn't know you could buy those in Europe. Where did you get them? Reach high for the stars! First Christmas card for the season!